We'd all love to somehow run into our favourite celebrity and discover that they'd like to go on a date with us. It's not impossible to wind up on a date with a celebrity if you know the right people or live near them, but you're not so likely to run into them on Tinder. Some people would like to think so though so when they swipe right on a familiar face, they're disappointed to see that they're taken to a promo instead. Their confusion is understandable to be honest. Though it seems very unlikely that these celebrities would actually be on Tinder, adverts are marked in the same way that verified accounts are. Tinder puts verification marks on official celebrity accounts to stop people from pretending to be this person. It works on the idea that not many people who are famous will use the service so unless you see that blue mark, you know the account is fake. So when they decided to mark promotions with the same symbol, it's no surprise that it has led to some annoyance and confusion. This celebrity profile actually being an advert has been going on for around about two years. 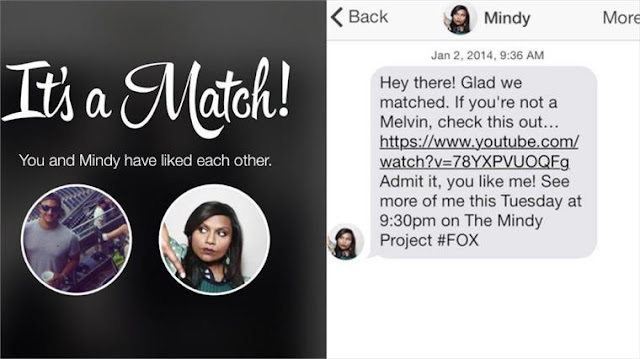 It started when Tinder created a user card for Mindy Lahiri, the comedienne Mindy Kaling's character from her show The Mindy Project. Since then there have been multiple cards created for characters that have been introduced to advertise various media. Most of the time it does just take you to a video or something similar, but for the film Ex Machina they acted as if the character was a real person. Eventually the advertisement said she was from the film, but until then it was basically a conversation with someone that these users couldn't hook up or have a relationship with which is kind of spammy. Tinder are trying to make the adverts more obvious by having promotional messages immediately after the user has swiped right. This is all Tinder are willing to do to change things though. Advertisements are the way they make most of their money so they won't apologise for encouraging users to interact with them.